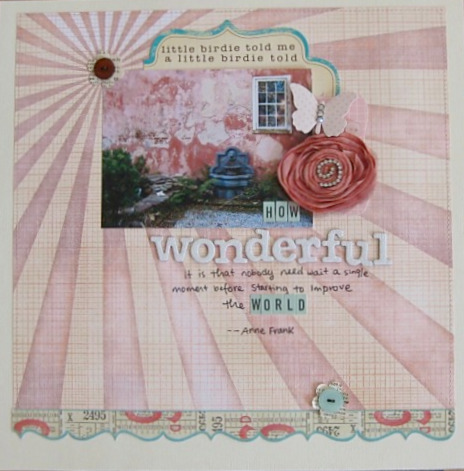 I made this page with the new April Studio Calico kit--still messing with the photo. I am really enjoying working with this kit! I mixed elements from Add-ons 2 and 3 in here, and had so much fun! And finally, the wonderful Sarah tagged me with a bloggy questionairre, so that's coming tomorrow! Assuming I'm not too decimated from the 30 minute presentation I have to give tomorrow. Oy. Send me articulate vibes, ok? 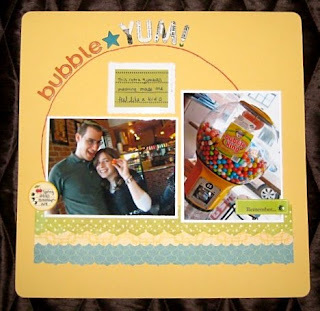 Love your gumball machine layout, its so fun. Both your layouts are terrific - but I'm partial to the sassafras lass paper on the bottom one! I left you some sunshine on my blog. ooooooooooooooooooooo love the 2nd one. what an awesome design and how you used the paper. i love the first one too, just the second one wowed me (diggin in deeper here lmao..) yum! Great layouts! Love the colors on both! Aw, cute pages! :) Just hopped over from Studio Calico, and you rocked the kit!! Lovely! And lots of fun stuff happening for you-so exciting! Love the layouts! Congrats on all the coverage you are now getting! That's awesome! love your layouts and i LOVE LOVE LOVE the layout at Ella's. So our NYC visit... my cousin live in NYC and has been helping us plan our visit. Going to Pastis for brunch and we have Wicked tix. Any other suggestions??? Awesome pages, love the second one esp. Good luck on your presentation! Your new SC LO is fantastic! And your photos are looking great! i could have sworn i commented on these! hmmm... LOVE the layouts, keshet. love! the bubble gum one is awesome! love your anne frank quote. so pretty! Congrats on the ezine & the unkit blog! How exciting!! The layouts featured are awesome! i just adore your 'wonderful' LO! and your 'bubble yum' LO is so fun!